Unimmunised children will be asked to stay away from South Australian preschools and care centres when there is a disease outbreak as part of a new procedure. Parents and carers will be asked to provide government pre-schools and care services with details of their children’s immunisations as part of a plan to protect unvaccinated children from the risk of catching or spreading infectious diseases. If a vaccine preventable disease (VPD) like chickenpox, measles or mumps has been detected at the centre, those without up-to-date immunisation records will not be permitted to attend sessions. The protocol begins from the start of term two and the time away from the centre will be determined by SA Health. Education Minister Susan Close said vaccinations were crucial to protecting children against preventable diseases and the procedure would allow services to act swiftly. “At any event of an outbreak of a disease we’ll be directing children away from the school if they’re not protected from that disease,” Ms Close said. “The best way to protect your children is to get them vaccinated. She said anyone with concerns should talk to their GP. 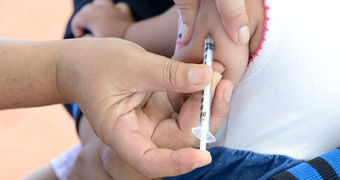 “We need to be very clear with parents, unless children have a particular health issue which means they can’t be immunised, then it is absolutely crucial that parents get their children right up to date with their immunisations,” Ms Close said. She said the state’s immunisation rate was about 93 per cent and the Government wanted it to be 95 per cent to create herd immunity. The announcement comes as the Health Minister Jack Snelling continues to work on drafting legislation that would give childcare centres the legal right to refuse enrolment to unvaccinated children. The unvaccinated kids are usually much healthier than the vaccinated kids with parents who have a clue about health. The vaccinated kids are the less healthy ones with parents who expose them to fluoride, feed them poly oil and other crap, give them pharma drugs, expose them to more chemicals and radiation, and so on. Maybe they don’t want the unvaccinated kids there, because when the vaccinated kids become ill and the unvaccinated do not, it makes the pro-vaxxers look stupid?